Home Learn English English Phrases With the Word TIME. ♦ A group of words or a part of a sentence that has a special meaning. ♦ At times, phrases carry a message that is totally different from its literal meaning and that’s what makes them so special. And everyone knows that in today’s world, it’s all about putting your best foot forward. TIME IS MONEY, MY FRIEND! Now imagine yourself in a conversation where you have to emphasize on the value of ‘time’ and someone said that ‘time is valuable and one should never waste it’. In the same conversation, there is this another person who says that ‘it is important to use time in a productive manner’. And that is the power of PHRASES. So if time is such a valuable thing, why not learn to use it in some other phrases as well? Here I have a list of 10 ENGLISH PHRASES WITH THE WORD TIME. When something’s done or happens at the last moment or just before it’s too late. ¤ My friend escaped the speeding bus just in the nick of time. To have a very difficult experience. ¤ It was one hell of a time that I spent in the hospital with a broken leg. It’s an expression to say that something would happen when the time is right. ¤ A: When will I get my big break? B: All in good time dear. The best time to do something. ¤ Mom is in a good mood today. I think the time is ripe to ask her for the school trip. To cheat or betray someone. ¤ Don’t get too close to him, he is a two-timing pervert. To have advanced ideas and attitude towards life and society. ¤ A leader should always think ahead of his time. Use it when you have a wonderful time with someone or at a social event. ¤ Thank you for a lovely evening. I had a time of my life with you. This represents a situation when you meet or try to talk to someone at an inconvenient time. ¤ Sorry to catch you at a bad time but I really need your help. Use it when you want to show that how urgently something should be done and not be delayed anymore. ¤ You have such bad eating habits. I think it’s high time/about time that you go and see a heart specialist. Used when you have a lot of free time or when you have to wait for someone. ¤ Ever since I lost the job, I have a lot of time to kill. 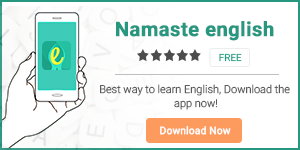 हिंदी के माध्यम से अंग्रेजी सिखने के लिए download करें हमारी English learning app Namaste English. Previous articleBoard Exams: PLEASURE or PRESSURE. You Decide.